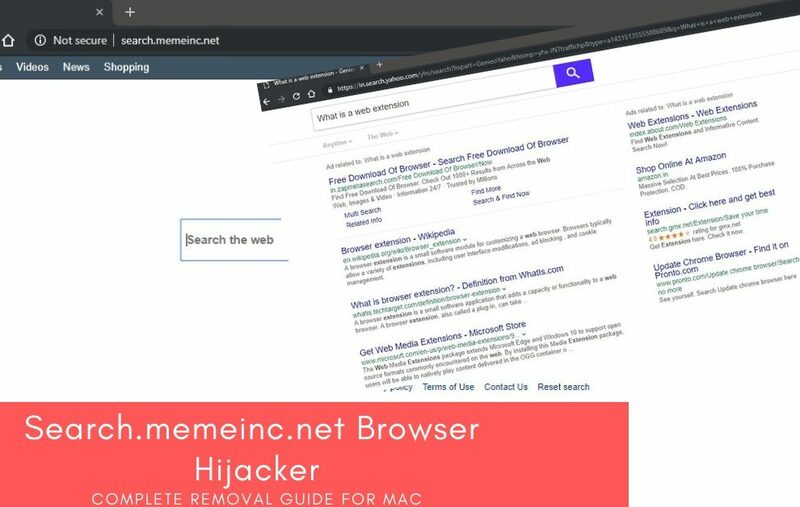 Search.memeinc.net is a browser hijacker that attacks Mac OS. This guide will help you aware of the threat,m its symptoms on the infected device and its removal solution. Search.memeinc.net is a dubious program that is designed to infect the Mac users. Browser hijacker are malicious programs that are designed to attack the computer system through controlling the installed web browsers. As browsers are the software that help us to connect and communicate through the entire web. So it is very easy for any virus authors to distribute potentially harmful program within fake ads, rogue extensions and freeware bundles. 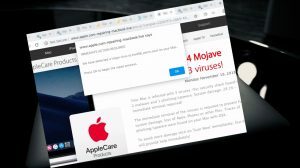 Just like the Chill Tab browser hijacker that is a persistent threat for Mac users. Search.memeinc.net is also a threat for Mac users. It is associated with “Meimeinc” extension that users may install on the web browsers like Google Chrome, Mozilla Firefox, and Safari. If you somehow install “Meimeinc” extension on your browser, then it will modify the default browser’s settings like homepage and search engine to hxxps://search.memeinc.net(don’t try out this link it may redirect you to virus page, it just to explain you its functions). So you may be forced to use this rogue search engine to perform your searches. While using this search engine, you may get search results loaded with intrusive advertisements, banners and sponsored links. Search.memeinc.net hijacker is often found to distribute other Adware programs like Adware.spigot. So, if you somehow got installed “Meimeinc” extension and your search page is altered to Search.memeinc.net, then need to found out ways to properly eliminate it. How can your Mac get infected with Search.memeinc.net? As said above, Search.memeinc.net hijacker program may enter on your PC along with freeware downloads. But it may intrude inside your computer without your consent. While you are surfing, you may suddenly click any link that redirect to you some third-party website, this is the social engineering trick to drop Adware within background. Not asking any permission for installation. As soon as “Meimeinc” extension is installed on your Mac. It starts attacking the default browser like Safari or Google chrome. Thus, you see your homepage, new tab and search engine being modified. Its feels too frustrating to see the preferred settings of the browser totally tampered. As we don’t have time always to set bookmarks, logins, our favorite page to quick links and so on. Search.memeinc.net can give you hard time while browsing. Lets aware you about some symptoms that will help you understand its modus operandi. The first sign on infection is seen as the change in browser’s default settings. In this case, you see “hxxps://search.memeinc.net” as replaced search engine. New toolbars, plug-ins, bookmarks and other unwanted programs will be added without permission. While you perform any searches, this fake search engine will drop lots of ads within the search results. Also, random ads can be seen within the visited URLs on the infected browser. It send the search queries to multiple websites that collect your browsing information and use them for displaying more advertisements. Search.memeinc.net uses the search service of yahoo to manipulate the searches and display the results. It is advised not to click on the links as they might be malicious and can drive more threats to the negotiated device. This notorious program will keep redirecting you to questionable websites and hamper your browsing. These activities surely affects the browsing performance and negotiates overall device performance. 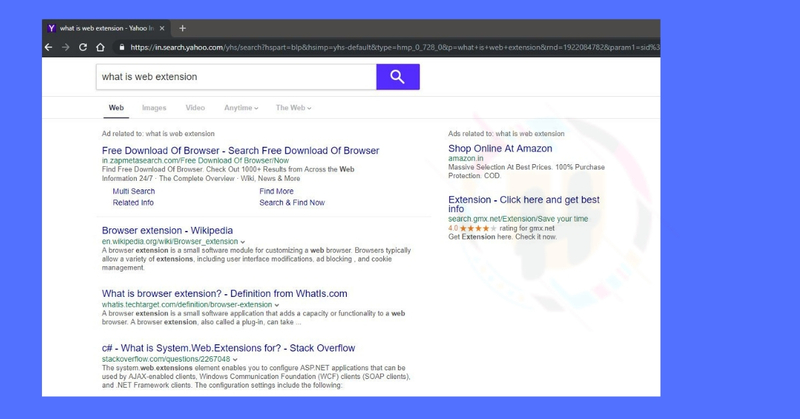 From all the above analysis, it is clear that Search.memeinc.net is a fake search engine and categorized as a browser hijacker. So users encountering this program must not entertain it and remove all the associated files as soon as possible. As far as the removal of Search.memeinc.net is concerned, it is very depressing to know that it is capable to revive again and again after you uninstall from the browser. 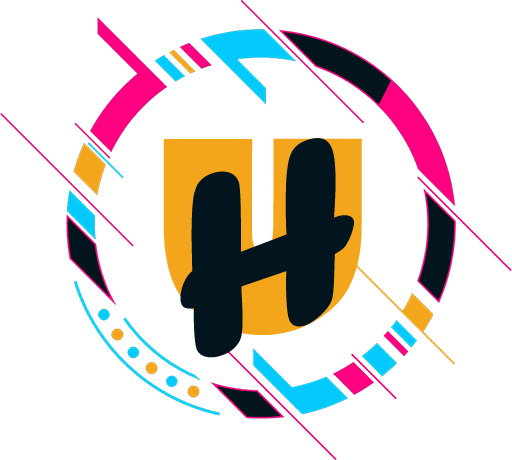 This happens because, it is not only a normal web extension instead it is a virus that makes various internal changes to the system files and directories. So, you should treat it as a virus and opt for complete removal solution to get rid of it. As a security researcher, we don’t advise you to manually remove Search.memeinc.net browser hijacker, as it is not even possible. So, better be patience and run a powerful anti-malware tool for removal process. Using an effective scanning tool is the best way to deal with such tough virus. As they won’t go away easily until their background processes, files and associated programs not be completely isolated from the infected machine. The scanning process may take few minutes, so, better be patience and let the automatic detection tool do its work. “Search.memeinc.net” may reinstall itself multiple times if you don’t delete its core files. We recommend downloading Combo Cleaner to scan for malicious programs. This may save your precious time and effort. For more review on combo cleaner and installation guide please follow the link. If you want to know more about Mac Os malware and wish to try out manual removal solution, then here is the step-by-step guide for it.